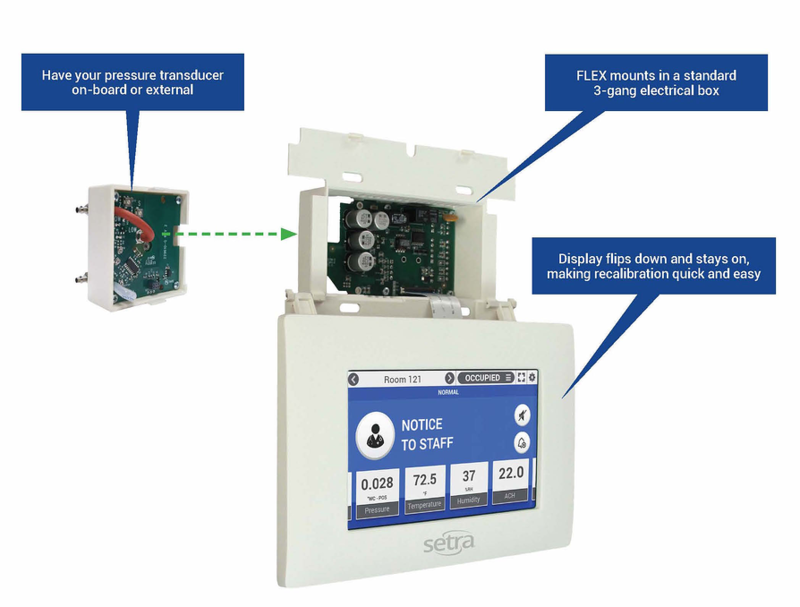 Setra FLEX™ is a complete monitoring and control solution in a pre-configured and easy-to-use package. Offering all of the essential parameters that require monitoring, FLEX will meet all of your critical environment needs. From the pressure experts comes the most accurate and reliable room pressure monitor in the industry - but that's not all. Now you can monitor and control pressures, temperature, humidity, and air changes per hour; plus, any two additional parameters you may require. Visualize the data by either hard wiring the sensors, or by mapping network objects via BACnet. FLEX is flexible enough to meet any HVAC sensing or control need and customizable enough to monitor energy usage and industrial equipment. Setra FLEX comes out-of-the-box ready to configure at the job site. No programming or training is required for setup. Just configure your sensors and network on-site and FLEX is ready to go. If there are many units to configure, our unique USB cloning feature helps you get them done even faster, saving time and money. FLEX comes in two models, providing both the best price-to-performance as well as the one-of-a-kind feature set to meet the most difficult application needs. Both FLEX models can be controlled over the network via read/write BACnet objects, permitting both local control via the touch screen or control from the BMS. 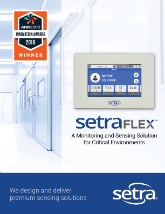 Setra FLEX™ provides a flexible room environmental control and monitoring solution in a simple-to-use package. An attractive flush mount face plate is complemented by an intuitive graphical display to meet any architectural requirement. The unit supports 3 rooms, monitoring up to 6 parameters for each room. If addition I/O is required, an expansion I/O module enables the monitoring and control for more complicated applications. An optional differential pressure sensor can be either factory-installed in the unit or ordered separately and installed above the ceiling. Integration with building automation systems is made easy through either BACnet/IP or BACnet MS/TP network protocols. Modular Design - A modular hardware design enables FLEX to fit in various wall thickness found around the globe. For applications which require the monitor to fit in wall depths less than 50mm, FLEX can be ordered with an external pressure sensor. When mounting in a three gang electrical box, FLEX can be ordered with an integrated on-board sensor. Sufficient on-board I/O provides connectivity for most common equipment and sensor applications. If additional connections are required, or if more advanced HVAC applications demand it, the expansion I/O module can be ordered as an accessory. A high accuracy of 0.25% differential pressure transducer is used in all pressure sensing options. A projected capacitive touch screen provides swipe functionality and allowed for use with medical gloves. Theface plate is attached to the unit body, enabling both tamper resistant operation and easy opening for pressure calibration. Setra FLEX-RM and FLEX-RC - FLEX software is designed to suit any application, with the ability to support up to 3 rooms. FLEX-RM (Room Monitor) provides monitoring only, for those applications where no control from the touch screen is needed. FLEX-RC (Room Control) offers monitoring, plus PI loop or network control of VAV boxes, venturi valves, or hydronic reheat valves. Software is pre-installed, with configuration and network integration done using simple setup screens. There is no programming required. 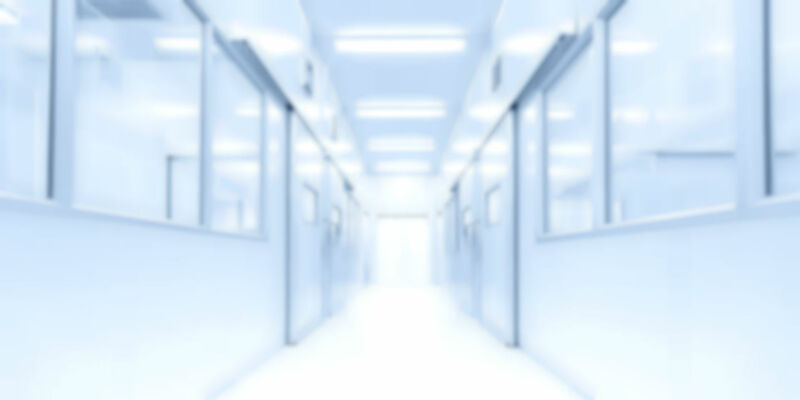 When completed, configuration settings on one unit can be cloned to other devices using a standard USB thumb drive, thereby shortening commissioning time. Units can also be configured remotely over a BACnet network. FLEX's monitor is both a controller and a monitor, with audible and visual alarming on all room parameters. FLEX's monitor enables users to save energy by choosing from two PI control loops and two monitoring sets for any of four room modes, such as occupied and unoccupied.